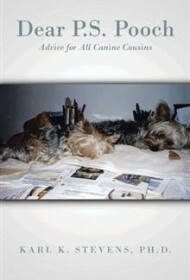 This is a lighthearted book “written” in the style of a newspaper advice column by a pair of Yorkshire Terriers who use the moniker “P.S. Pooch.” The terriers respond to questions from other four-legged “readers.” Divided into sections such as “Family and Friends,” “Cats,” and “Entertainment,” the questions posed address topics that might be of interest or concern to an animal, generally dogs or cats. It’s all delivered lightly, but nonetheless could be potentially lifesaving, such as an item regarding the dangers of dogs eating grass treated with insecticides. While ostensibly addressed to pooches, human readers who take the advice to heart will be better able to protect their pets. Occasionally, P.S. Pooch offers answers meant to be humorous that miss the mark, but overall, the book should earn a grin from animal lovers. It would make a nice addition to a veterinarian’s waiting room or any such place where a brief, light read would be welcome.